Stand alone or series: Book 1 in a planned trilogy. Why did I read this book: Author Cinda Williams Chima contacted us with a review query, and after checking out the: 1. gorgeous cover; 2. awesome, in-depth synopsis; 3. really cool book trailer and excerpt; and 4. fawning blurbs from the likes of Tamora Pierce & Robin Hobb; well, I was sold. Times are hard in the mountain city of Fellsmarch. Reformed thief Han Alister will do almost anything to eke out a living for himself, his mother, and his sister Mari. Ironically, the only thing of value he has is something he can’t sell. For as long as Han can remember, he’s worn thick silver cuffs engraved with runes. They’re clearly magicked-as he grows, they grow, and he’s never been able to get them off. While out hunting one day, Han and his Clan friend, Dancer catch three young wizards setting fire to the sacred mountain of Hanalea. After a confrontation, Han takes an amulet from Micah Bayar, son of the High Wizard, to ensure the boy won’t use it against them. Han soon learns that the amulet has an evil history-it once belonged to the Demon King, the wizard who nearly destroyed the world a millennium ago. With a magical piece that powerful at stake, Han knows that the Bayars will stop at nothing to get it back. Meanwhile, Raisa ana’Marianna, Princess Heir of the Fells, has her own battles to fight. She’s just returned to court after three years of relative freedom with her father’s family at Demonai camp – riding, hunting, and working the famous Clan markets. Although Raisa will become eligible for marriage after her sixteenth name-day, she isn’t looking forward to trading in her common sense and new skills for etiquette tutors and stuffy parties. Raisa wants to be more than an ornament in a glittering cage. She aspires to be like Hanalea-the legendary warrior queen who killed the Demon King and saved the world. But it seems like her mother has other plans for her–plans that include a suitor who goes against everything the Queendom stands for. On a day like any other, Han “Cuffs”/”Hunts Alone” Alister and his best friend Dancer go a-hunting, only to run into three riders and an inexplicable fire. The three outsiders turn out to be charmcasters (wizards), intruding on Clan land and violating the Naeming – a thousand year truce between the green magic Clan and the Wizard nobility, after the world was torn apart by reckless magic. The charmcasters are trailed by a magic-fueled and colored fire, burning land that should not be able to burn so early in the season, and an enraged Dancer demands that the wizards – the same age as Dancer and Han – turn over their ill-gotten amulets, which allow them to use magic. Things get ugly between Dancer and the leader of the wizard riders, a cruelly handsome young man named Micah Bayar, who also happens to be son of the most powerful wizard in the kingdom. When Micah refuses to relinquish his amulet, Han resorts to aiming an arrow at his heart – and Micah and his lackeys are forced to comply, leaving the amulet in their wake. Dancer – whom Han is uncomfortably discovering has secrets about his knowledge of wizard magic – tells Han to throw the amulet away…but there’s something important about it. Instead, Han keeps it close, figuring he can at the very least sell it for a tidy sum later if need be. But then the murders begin in Fellsmarch – anyone connected to the mysterious amulet or that might know of its whereabouts are being killed one by one, and their deaths blamed on Han. What’s even more disturbing is when Han discovers that the amulet is a very powerful, ancient relic of The Demon King himself, the wizard that nearly destroyed the world a thousand years ago – and somehow, the amulet is connected to him, and the mysterious, permanent silver cuffs that have encircled his wrists since birth. Meanwhile, in the royal palace, things have also gone awry. Young crown princess and heir to the kingdom, Raisa ana’Marianna, awaits her sixteenth name-day celebration, when she will become eligible for marriage. As her father, the royal consort, is a Demoni warrior and of the Clan, she has just returned to the palace from her education with her grandmother and the Clan – much to the irritation of her mother, the lovely but flighty Queen Marianna. Something has changed in the palace, and Raisa begins to receive foreboding warnings, visions of dark times to come. Her mother is spending far too much time with her head Wizard, the handsome and ambitious Lord Bayar, while Raisa’s own father has been busy scouting the wars to the south. And Queen Marianna seems so ineffectual, so uncaring and distracted when it comes to ruling her own kingdom – and Raisa fears that her mother is under the influence of advisers that promote only their own personal goals, without the good of the kingdom in mind. As her name-day approaches, Raisa also must fend off suitors – especially the intoxicating attentions of young wizard Micah Bayar, and her own old best friend and now personal guard, Amon. Too, she must learn how to become a good Queen, a strong one that represents the best of her people – and as a sinister plot begins to form concerning the future of the kingdom through Raisa, she must discern who to trust, and take a stand for herself. 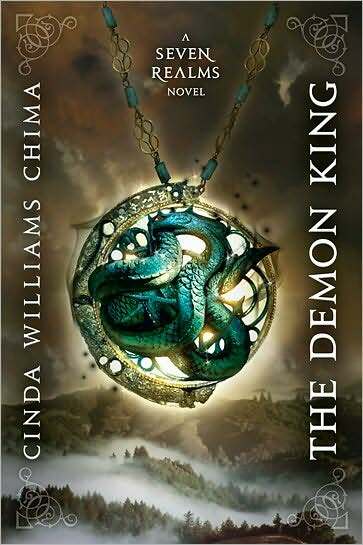 The Demon King is the first book in a brand new trilogy from Cinda Williams Chima (best known for her “Heir” books), and introduces readers to a new, enticing world. Though I haven’t read anything by Ms. Chima before, I can safely say that her worldbuilding skills are absolutely fantastic (and I have a hunch her earlier fantasy titles also reflect this gift for worldweaving). The realm of the seven kingdoms, of Fellsmarch, the Clan camps, the palace and the rich history of the realm is truly awe-inspiring. I loved the changing nature of history that Ms. Chima manages to capture, as myth and fact are interchanged over the years. The backstory of the Demon King and his tragic, doomed love affair with the Queen Hanalea is the stuff of epic ballads, and resonates wonderfully throughout the novel. The social structure, the geography, the careful balance between Clan and Wizard magic is similarly well-constructed, and consequently the changing of that precarious balance feels all the more sinister and terrifying. In terms of plotting and pacing, The Demon King also does a fair job, as it is written well, told in an authoritative and convincing voice, and culminates in a brilliant ending (even if the early chapters drag ever so slightly). Han/”Cuffs”/”Hunts Alone” – Fatherless, impoverished reformed thief-lord teenager with a heart of gold (he only stole to feed his mother and younger sister, dontchaknow); blonde, blue-eyed, charismatic, attracts trouble (and the ladies) at every turn; has silver cuffs on his wrists that soak up magic and mysteriously accommodate his growth over the years; can handle wizard amulets even though they destroy others. Raisa ana’Marianna – Crown Princess, BEAUTIFUL, attracts multiple suitors including 1. The Bad Boy Wizard; and 2. Her childhood friend and dependable (and now super hot) Bodyguard; willful, headstrong, naive, but determined to do the right thing; at more than one point in the story dresses up as a boy to escape the palace. Micah – POWERFUL young wizard; devastatingly handsome (of course in a DARK way); cruel, at times cowardly, used as a tool by his ambitious father (who is everything Micah is, just MORE evil and dark); has sinister goals towards Raisa and the Queen. Amon – Raisa’s childhood friend, son of the Queen’s Captain of the Guard; went away for training and returned a brawny young man; unflinchingly devoted to his childhood friend Raisa (to whom he is also incredibly attracted). Do you see where I’m going here? This brief list doesn’t even include the wise Grandmother, the kind Father, the gruff Captain of the Guard, the beautiful but enchanted Queen, and the Evilest of Evil Wizards. There’s a whole lot of predictability with the plot and the characters because it is a story that has been told many, many times before. BUT, despite this familiarity, Ms. Chima proves that even the oldest tropes can still be really entertaining. As our hero, Han is pretty cool and easy to like. Raisa is a little harder to peg – at times she’s your typical headstrong (nonetheless totally lovable) heroine; but she also has some incredibly stupid moments. She can be superficial and shallow, but this adds a dimension of believability to her character – after all, she’s a beautiful, young, sheltered princess. Perhaps the most frustrating (but understandable) thing about The Demon King is that it is a First Novel in a trilogy. It sets the stage, but leaves off when the really good, interesting stuff begins. But, hey, that’s a good thing! There are a number of predictable revelations in the book’s final act, and yet despite all this familiarity, The Demon King is an eminently readable book. I finished excited for the second novel, and cannot wait for it to hit shelves hopefully next year. Definitely recommended for fans of traditional fantasy. Han eased to his feet and drew the bowstring back to his ear. Then paused, sniffing the air. The breeze carried the distinct scent of woodsmoke. His gaze traveled up the mountain and found a thin line of smoke cutting across the slope. He looked at Dancer and raised his eyebrows in inquiry. Dancer shrugged. The ground was soaked and the spring foliage green and lush. Nothing should burn in this season. The deer in the meadow caught the scent, too. They raised their heads, snorting and stamping their feet nervously, the whites showing in their liquid brown eyes. Han looked up mountain again. Now he could see orange, purple, and green flames at the base of the fire line, and the wind blowing downslope grew hot and thick with smoke. Purple and green? Han thought. Were there plants that burned with colors like those? The herd milled anxiously for a moment, as if not sure which way to go, then turned as one and charged straight toward them. Han hastily raised his bow again and managed to get off a shot as the deer bounded past. He missed completely. Dancer’s luck was no better. Han sprinted after the herd, leaping over obstacles, hoping to try again, but it was no use. He caught a tantalizing glimpse of the white flags of their tails before the deer vanished into the pines. Muttering to himself, he trudged back up to where Dancer stood, staring up the mountain. The line of garish flame rolled toward them, picking up speed, leaving a charred and desolate landscape in its wake. They ran across the ridge, slipping and sliding on the shale and wet leaves, knowing a fall could mean disaster. They took refuge behind a rocky prominence that pierced the thin vegetative skin of the mountain. Rabbits, foxes, and other small animals galloped past, just ahead of the flames. The fire line swept by, hissing and snapping, greedily consuming everything in its path. And after came three riders, like shepherds driving the flames before them. Han stared, mesmerized. They were boys no older than Han and Dancer, but they wore fine cloaks of silk and summer wool that grazed their stirrups, and long stoles glittering with exotic emblems. The horses they rode were not compact, shaggy mountain ponies, but flatlander horses, with long, delicate legs and proudly-arched necks, their saddles and bridles embellished with silver fittings. Han knew horseflesh, and these horses would cost a year’s pay for a common person. A lifetime’s earnings for him. The boys rode with a loose and easy arrogance, as if oblivious of the breathtaking landscape around them. Charmcasters, Han thought, fear and excitement thrilling through him. He’d never seen one close up. Wizards did not consort with people like him. They lived in the elaborate palaces surrounding Fellsmarch Castle, and attended the queen at court. They served as ambassadors to foreign countries—purposefully so. Rumors of their powers of sorcery kept foreign invaders away. Additional Thoughts: Want more info on The Demon King? Check out Cinda Williams Chima’s awesome website, complete with supplemental info on the book (including a character glossary, history of the Seven Realms, book excerpt, etc)! Verdict: A promising start to a strong new (if somewhat traditional) fantasy series. I eagerly await the release of Book 2, The Exiled Queen! Definitely recomended. I’m glad it was well received by the review-the Heir series is also well written but along the same traditional lines. I have this on the TBR pile so it’s my next book now, thanks again for another awesome review! I dunno..it sounds interesting, but for some reason I can’t get past the cover. I don’t like it. I like change, I really do, but that title and author name written like that is driving me NUTS. It seems insane to me to write them that way. The author has a lovely, yet very unique name. I can’t read it laid out in the manner it is. I should be looking at the artwork, be engaged by it and therefore having my interest sparked by what’s inside. Instead I’m put out because the author name and title are not immediately easy to read. I would pass on this one at the store, and definitely do now just looking at it online. I’m approaching ranting in feeling if not actual writing of opinion at this point, so I’ll stop – but MAN! What were they thinking? The art is pretty, but the text on it is plain loopy. I can’t wait to get my hands on this one! Every review gets me more excited. Good book. 🙄 Okay REALLY good book! I agree with the archetype of the characters. Sadly, this made the book rather unattractive to me and even though I am three quarters of the way through, I have no inclination to finish it and so I thank you for the synopsis you’ve written up. You’ve saved me a good amount of time. I read the book and absolutely hated it it was by far the worst book i have read. Would not recommend it.